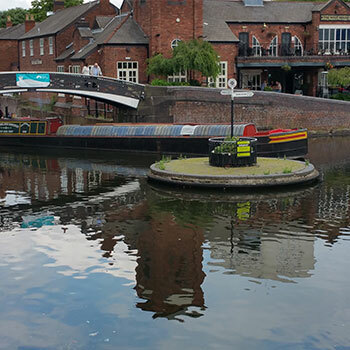 Canals and Lock Sizes are one of the most common things asked about the waterways in the UK. The following data has been provided to help answer some of the most often asked questions "Can I take my boat across the Leeds & Liverpool Canal? " or "What is the maximum size of boat that can travel all the canals and waterways on the connected system?" So here is a list of all canals with the lengths and widths for each waterway. We do advised you to check particulars with the navigation authority before undertaking voyages into unfamiliar waters. The follow data is correct but one must understand, that because one 60ft boat passed through, your vessel may not even though 60ft due to its design. The normal rule of thumb is that a 57ft narrowboat will be able to access 99% of the system and a 60ft about 80% of the system. Please also check the navigation authority websites as there maybe imposed restrictions due to bridge or lock work. Canalnarrowboat.co.uk will not be held responsible for any wrong or changed information below. Length 72 feet, beam 7feet. Length 78 foot 6 inches, beam 16 foot 6 inches. Length 142 foot, beam 17 foot 6 inches. Length 70 foot, beam 7 foot. Length 50 foot, beam 9 foot 10 inches. Wakefield to Broadcut Top Lock: Length 120 foot, beam 17 foot 6 inches. The rest of the navigation to Sowerby Bridge: Length 57 foot 6 inches, beam 14 foot 2 inches. Length 70 foot, beam 7 foot, applies to the whole BCN. Into Heybridge Basin: Length 107 foot, beam 26 foot. The rest of the naviagtion to Chelmsford: Length 60 foot, beam 16 foot. Length 150 foot, beam 35 foot. River Trent to Retford: Length 72 foot, beam 14 foot. Retford to the head of navigation: Length 72 foot, beam 7 foot. Length 88 foot, beam 20 foot. Length 72 foot, beam 7 foot. Length 61 foot, beam 14 foot 6 inches. Length 71 foot 6 inches, beam 7 foot 1inch. Length 71 foot 6 inches, beam 9 foot 6 inches. Length 70 foot, beam 12 foot 6 inches. Length 122 foot, beam 26 foot 3 inches. Length 68 foot 6 inches, beam 19 foot 8 inches. Length 74 foot 6 inches, beam 15 foot 2 inches. Length 240 foot, beam 30 foot. Length 75 foot, beam 14 foot. Trent Lock to Length 72 foot, beam 14 foot 3 inches. Norton Junction to Foxton Junction (the old Grand Union canal): Length 72 foot, beam 7 foot. Foxton to Leicester: Length 70 foot, beam 13 foot. Leicester to Trent Junction (the River Soar): Length 72 foot, beam 14 foot 4 inches. Brentford to Camp Hill Top Lock: Length 72 foot, beam 14 foot. Camp Hill Top Lock to Salford Junction: Length 72 foot, beam 6 foot 10 inches. Length 72 foot, beam 14 foot 6 inches. Length 78 foot, beam 14 foot 6 inches. Length 57 foot 6 inches, beam 14 foot 2 inches. Length 70 foot, beam 6 foot 10 inches. Length 70 foot, beam 14 foot. Length 72 foot, beam 14 foot. Reading to Newbury: Length 75 foot, beam 14 foot. Newbury to Bath: Length 72 foot, beam 14 foot. Bath to Hanham Lock: Length 75 foot, beam 16 foot. Length 62 foot, beam 14 foot. Length 72 foot, beam 15 foot. Leeds to Wigan: Length 62 foot, beam 14 foot. Wigan to Liverpool: Length 72 foot, beam 14 foot. Length 100 foot, beam 24 foot. Length 70 foot, beam 14 foot 10 inches. Large locks: Length 600 foot, beam 65 foot. Parallel smaller locks: Length 350 foot, beam 65 foot. Horseway Lock: Length 60 foot, beam 11 foot. Welches Dam Lock: Length 47 foot, beam 11 foot. Stanground Lock: Length 80 foot, beam 11 foot 6 inches. Marmont Priory Lock: Length 92 foot, beam 12 foot. Salters Lode Lock: Length 62 foot, beam 12 foot 6 inches. Note it is possible for longer boats to pass through this lock in favourable states of the tide. Ashline Lock: Length 80 foot, beam 11 foot 6 inches. Length 64 foot 9 inches, beam 9 foot 2 inches. Navigation is restricted to boats of length 50 foot, beam 8 foot 6 inchs because of a bridge on a sharp bend. Length 60 foot, beam 9 foot. Hermitage Sluice: Length 90 foot, beam 12 foot 6 inches. Denver Lock: Length 96 foot 9 inches, beam 17 foot 8 inches. Length 88 foot, beam 14 foot 6 inches. Length 72 foot, beam 6 foot 10 inches. Length 57 foot, beam 14 foot 3 inches. Length 58 foot, beam 14 foot. South Ferriby Lock: length 68 foot, beam 19 foot. Harlam Hill Lock: length 40 foot, beam 12 foot. Through the Cumberland Basin Entrance Lock: length 324 foot 9 inches, beam 48 foot 10 inches. Through Netham Lock: length 80 foot, beam 17 foot 8 inches. Lock sizes vary but the maximum craft size for navigating the whole waterway is: length 70 foot, beam 13 foot 6 inchs. Lock sizes vary but the maximum size of craft navigating the river is length 70 foot, beam 12 foot 6 inches. Length 100 foot, beam 14 foot. Through Barmby Barrage Lock: Length 62 foot, beam 16 foot 6 inches. Sutton Lock: Length 54 foot 6 inches, beam 13 foot 9 inches. Length 97 foot, beam 18 foot 6 inches. Individual lock sizes vary but the maximum size for navigationfrom Bedford to the Wash is Length 85 foot 4 inches, beam 10 foot 4 inches. Brandon Lock (opened 1995): Length 40 foot 4 inches, beam 12 foot. Allington Lock to Maidstone: Length 175 foot, beam 21 foot 6 inches. Maidstone to Tonbridge: Length 80 foot, beam 18 foot 6 inches. Length 90 foot, beam 19 foot 6 inches. Length 84 foot, beam 16 foot. Length 85 foot, beam 13 foot 3 inches. Naburn Lock maximum craft size: Length 150 foot, beam 25 foot 6 inches. Linton Lock: Length 60 foot, beam 15 foot 4 inches. Length 78 foot, beam 14 foot. Note – Irthlingborough Bridge restricts the maximum beam of craft navigating the Nene to 13 foot. Length 54 foot, beam 14 foot. Length 56 foot, beam 13 foot 9 inches. Lock sizes vary but the maximum craft sizes are from Gloucester to Worcester: Length 135 foot, beam 21 foot. From Worcester to Stourport: Length 90 foot, beam 19 foot. Lock sizes vary but the maximum dimensions for craft navigating the waterway are as follows. Derwent Mouth to Meadow Lane Lock (Nottingham Canal): Length 81 foot, beam 14 foot 6 inches. From Meadow Lane Lock to the tidal river: Length 165 foot, beam 18 foot 6 inches. Lock sizes vary but the maximum dimensions for craft navigating the river are as follows. Lechlade to Oxford: Length 109 foot, beam 14 foot. Oxford to Reading: Length 120 foot, beam 17 foot 3 inches. Reading to Windsor: Length 130 foot, beam 17 foot 6 inches. Windsor to Teddington: Length 174 foot, beam 19 foot 10 inches. Westwick Lock is the smaller of the two locks and is length 57 foot, beam 14 foot 6 inches. Length 72 foot, beam 13 foot 10 inches. Fulney Lock: Length 62 foot 4 inches, beam 27 foot 10 inches. Winsford Bridge to Northwich: Length 130 foot, beam 35 foot. Northwich to Weston Point: Length 150 foot, beam 35 foot. Length 78 foot, beam 15 foot 2 inches. Length 74 foot, beam 14 foot 2 inches. Keadby to Bramwith is restricted by Thorne Lock to length 61 foot 8 inches, beam 17 foot. From Bramwith to Rotherham maximum craft size is length 229 foot 8 inches, beam 20 foot. From Rotherham to Sheffield: Length 61 foot 6 inches, beam 15 foot 3 inches. Sykehouse Lock: Length 215 foot, beam 22 foot 6 inches. Length 72 foot, beam 14 foot 9 inches. From Autherley Junction to Nantwich (the old Birmingham & Liverpool Junction Canal): Length 72 foot, beam 7 foot. From Nantwich to Ellesmere Port: Length 72 foot, beam 14 foot 9 inches but note that other structures on the waterway limit craft to a beam of 9 foot. Length 70 foot, beam 15 foot 6 inches. Length 64 foot, beam 7 foot 6 inches. Derwent Mouth to Burton-on-Trent: Length 72 foot, beam 14 foot. Burton to Middlewich Lock 74: Length 72 foot, beam 7 foot. Middlewich Big Lock: Length 72 foot, beam 14 foot. From Middlewich to Preston Brook the maximum beam for craft is 9 foot. Maximum dimensions for craft are Length 60 foot, beam 10 foot. Length 71 foot 6 inches, beam 7 foot.